What is the difference between a CCMA & a CMAA? In the medical field, acronyms rule the world. Two acronyms that get confused a lot are CCMA and CMAA. 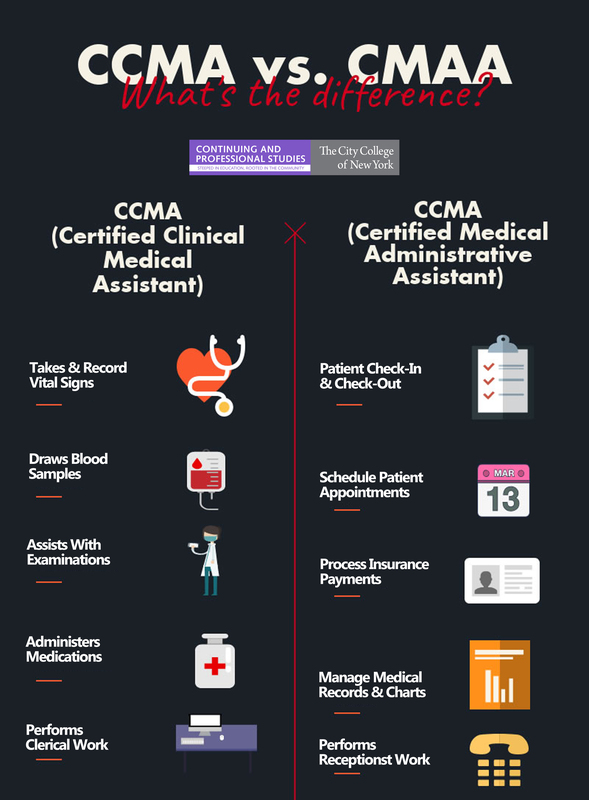 CCMA is an acronym for Certified Clinical Medical Assistant, while CMAA stands for Certifed Medical Administrative Assistant. A Certified Clinical Medical Assistant is a vital member of a medical team whose work entails administering medications, assisting with minor procedures, collecting laboratory specimen, perfomring electrocardiograms, providing patient education, and more. A Certified Medical Administrative Assistant, also a vital member of a medical team, is responsible for scheduling appointments, data entry, managing patient check-in/check-out, managing the front desk, or performing the overall administrative procedures of any healthcare facility. For those interested in becoming a CCMA, most programs usually double the hours of what is neessary for CMAA students. Here at City College of New York's Office of Continuing And Professional Studies, such is the case. Our National Healthcare Association (NHA) certfied CCMA course is a 472-hour program that prepares students for both administrative, and clinical duties! While our CMAA course focuses on just the clerical aspects in half the time (264 hours). Not to mention, our CCMA program has a 98% pass rate on National Health Career Association exam! Reference our helpful inforgraphic below.